It's been a very rewarding year working with Liz Hatch of Team Vanderkitten. Early last year, my good friend Dave (VK's Head Kat) wanted me to develop an all-around road bike that Liz could use for training and racing. And damn if she didn't deliver the goods! Of course I've been pleasantly surprised at this bike's versatility since my background involves over ten years of mountain bike R&D. Sure I like the sleek lines and snappiness of road bikes; but my true passion involves dirt riding. No cars to worry about (just ranger trucks), the woods are quiet (except when ranger trucks appear) and it's easy to focus only on riding and railing singletrack (except when rangers have radar). For me, moving into road bike design is like asking Fox to develop a road fork. But good things do emerge when you stretch yourself and move beyond your comfort zone. Hence the VK-1 Prototype was born. 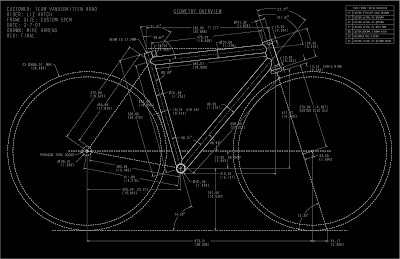 Designing Liz's road bike involved a healthy dose of 'seat of the pants engineering' since my experience with road bike design is limited. I know how I like bikes to handle (on or off road) and my goal is to translate this subjective feeling into actual geometry. To figure out the correct geometry, I looked at my own experiences on road/cross bikes and realized a semi-compact frame would offer the stiffness and response needed for Liz's explosive riding style and competitive nature. From the start I knew this frame would be aluminum; it's light, stiff and great for race bikes. And fat TIG-welded tubes just look sweet in my opinion. The aluminum we're using isn't straight gage stuff from your local industrial tubing house....it's highly-tuned with taperwalled construction that truly tunes the bike's ride quality. Soft enough to not be jarring, the tubing of choice is Easton Ultralite....which gained its roots in mountain biking right when I got involved in the sport. If you're still reading, this is where the technical details emerge. Liz provided me with fit measurements and it was apparent that a 52cm with longish top tube would fit the bill. Since Liz would only have one bike for the season, I opted for a slightly taller head tube so that training rides wouldn't position her into race mode every time she rode the bike. My idea was that different stems could be used...one for training and different ones for racing (depending on type of race). This adds more planning effort but when one frame is all you've got, compromises have to be made. The head angle is conservative at 72.3 deg...not too snappy but very stable at high speed. This is important since carbon forks have some flex under heavy braking and I wanted to minimize chatter while maximizing control at higher-speeds. The seat angle is slightly forward at 74 deg for good power transfer and even weight distribution over the front of the bike. This is important when longer top tubes are involved...it's very easy to have too much weight on the rear wheel and the front end can feel a little soft. The BB drop is 75mm and the chainstays are just shy of 412mm (for added stability at speed). Like any design project, the final solution for the VK-1 Prototype contains a series of compromises that yields a certain result. In this case, the result is a semi-compact frame that is a 'jack of all trades' and suitable for Liz's aggressive riding style. I must mention that Liz is a true competitor and one of the nicest athletes I've ever worked with in cycling. 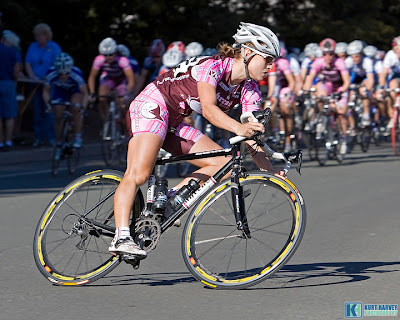 Liz crit-raced this bike all over the country and earned many podium finishes. The frame has also been crashed, scuffed, dinged, components torn apart, steer-tubes cracked, parts re-assembled, chains re-lubed, shifters re-tuned and this baby keeps on rolling. Long rides, short rides, training rides, fun rides and hill climbs, this bike does it all. Special thanks to Jason Grove for fabricating this high-performance machine to my exacting design standards. At 2.5 lb frame weight, the core material of this frame is tried-and-true Easton Ultralite tubing in the front triangle/seatstays and slightly oversized Columbus s-bend chainstays for added lateral stiffness behind the BB shell. Smart geometry and engineered tubing come together in a cohesive package that clearly benefit the rider in all types of conditions...damn I love this bike! With risk comes reward and I'm truly glad I stepped out of my comfort zone to build something unique! On and off the bike, I believe that Team Vanderkitten is changing the face of women's cycling. 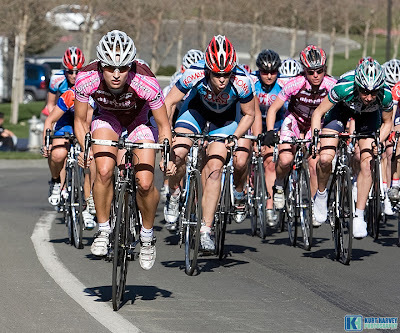 Ahrens Bicycles wishes Liz Hatch and Team Vanderkitten success during their 2008 race season....these kats are on the prowl (even if they will be riding full-carbon rigs from BH)! 4th at Boulevard Road Race > 3 laps totaling 104km; each lap has 3,000 feet of climbing! 3rd at Red Trolley Crit > race leaders lapped the field!